I’ve been using Twitter account names a lot recently in retweeting — They’re good, attention-grabbing handles. It’s easy to find out if a company has an account, by simply adding the obvious name to the twitter.com/xxxx URL. That usually works, as shown below. But not for Apple. There have been speculations about Apple’s not using Twitter — Last year Dave Greenbaum in GigaOm speculated (wrongly so far) that Apple would be Twittering soon, and there’s even a Quora article Why doesn’t Apple have a Twitter account? In March, Dutch blogger Kees Henniphof wrote that Apple doesn’t do social, pointing out that Apple’s non-social media choice extends beyond Twitter to other media like Facebook and LinkedIn, and says that by their non-participation, Apple is making “a statement.” I’d say they’re missing an opportunity. Posted in Apple, PicsNo, Twitter, Uncategorized. Will the Mac have an OS XI? In this article I discuss two topics that relate to this — In the first part of the article, I’ll discuss the name of the current Mac OS — Is it Mac OS X (letter X) or is it Mac OS 10 (number 10)? This is a well-known subject for long-time Mac users, but I haven’t seen other talk about my suggestion that Steve Jobs carefully crafted the “OS X” name as a brand that he and Apple won’t give up easily. In the second part of the article, I discuss how the iPad changes the game for the Mac OS and my prediction of what this means for Apple. Is “Mac OS X” a Steve Jobs Pun? The story of Steve Jobs’ firing and “second coming” at Apple has been told many times. For the purposes of this article, the highlight of the story is his founding of the Unix-based NeXT computer (when he was away from Apple), and then, when he returned as CEO, his fostering the adoption of its OS, which became Mac OS X. The Unix base of OS X was a large break from the previous non-Unix “Classic” Mac operating systems 1-9. … This is all common knowledge, but one aspect of the advent of OS X gets less attention (at least in writing) and that’s the name “OS X” –Why is it X instead of 10? A little digging reveals that the letter “X” has particular significance in the Unix world — When Unix people see a word with “x” in, they take notice because Unix-related words often have an “x” in. So it seems likely that the X was chosen with Unix in mind — A cute Unix insider pun. Surprisingly, though, I can’t find anything that describes the naming of OS X as a pun — Googling for “mac os x” pun or “mac os x” name pun or “mac os x” “double meaning” should certainly pick up something, but it doesn’t. I suspect that there was discussion of this when Mac OS X launched in 2000, and that I’m missing it. Talk on the Web was not nearly as well-developed then as it is now, though, so maybe it’s not there. So why is this little pun important? Because it brings up the much more interesting idea – Where did the pun come from? Who thought of it? Was it Steve Jobs? If he didn’t think of it himself, he certainly would have been involved in its adoption. It seems likely that there was deep thought given to the name, that it didn’t “just happen” casually. How interesting and serendipitous that when Jobs brought Unix to the Mac, the versions of the OS just happened to be at OS 9, set to advance to … OS 10 >> OS X. But — Suggesting that the weighted meaning of “OS X” had been a long time in the planning, one commentator says that Apple pushed along pre-OS X versions from 8 to 9 so that the version number would be at “10” when the new Mac-Unix OS was ready to launch. With this sort of long-range planning, it’s unimaginable that CEO Jobs would not have been heavily involved. It’s also an indication, I think, that Apple has a heavy investment in the name “OS X” and that they won’t be quick to move on to another name/version. After the iPad – Mac OS XI or iOS? 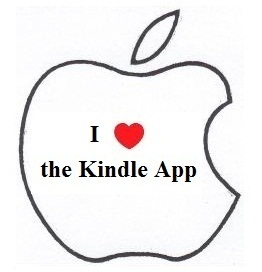 Part of the phenomenal success of the iPad is that it’s created a new category. Before the iPad, “mobile” meant a device you could hold in one hand. The operating systems of such devices were different from those on laptops and desktops. But the iPad is nudging into the laptop category and it uses the same iOS operating system as the iPhone. So there’s been much recent speculation that the future operating system for Apple computers and devices will in some sense merge into one. The downsizing of Mac OS X is already starting to happen, with the smaller footprint of its newest version (Snow Leopard), and the trend will likely accelerate as iPad/Tablet computing increase. With Mac OS X about to reach its 10th birthday (Xth birthday 😉 ) in March 2011, its interesting serendipitous life continues — Who would have ever guessed that it would persist for 10 years, right up to the next stage of computing, which is being ushered into existence by … Apple Computing with iPhone and iPad? 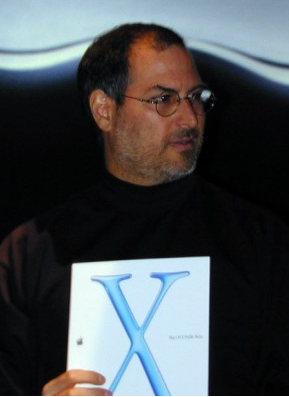 Did Steve know all along and that’s why he held on to the “X” brand for so long? My Prediction – I’m not taking sides in the debate about whether OS X is a version of the Mac OS or whether it’s a separate OS, and what the next Apple operating system will be called. 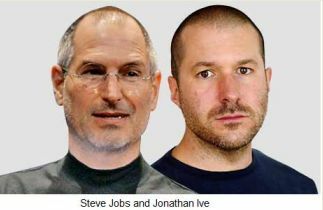 What I am predicting is that the Mac OS and iOS will grow more alike, which is not original with me, as noted above. I’ll go a step further, though, and predict that around the 10-year birthday of Mac OS X in March, 2011, Steve Jobs will make some sort of announcement about the future direction of the Apple operating system — It’s just too good an opportunity for Steve miss it — The stage is set for the next episode in … the serendipitous life of Mac OS X. Posted in Apple, PicsYes, Steve Jobs, Uncategorized. In its original meaning Elegance had to do with tasteful and graceful. In Sci-Tech-CompSci, it’s come to be associated with simplicity – surprisingly simple yet effective (Wikipedia) … cleverly simple (FreeDictionary) — I’ve written quite a lot on this blog about the concept of simple design, especially in the context of library user-interface (UI) issues and design for mobile devices. Recently, I’ve also been thinking about simplicity in the context of my experience with Hardin MD, remembering the value of list-keeping in pre-Google days — A simple task, but a surprisingly difficult one to execute. Quality list-keeping, UI design and mobile design — those fit well within the concept of “simple” — But moving beyond those, I’m seeing that there are broader topics that I’ve been writing about that extend the concept of “simple” to something more like “elegant.” I think of there being a continuum from the simple list-keeping of the early Web to simple design to the full-fledged Elegance of the giants discussed below, and I see all of these as being motivated by the same instinct, and blending together so much that they’re hard to separate. So I’m making a new category — Elegance — and putting all of the blend into it — Simple to Elegant. Google – Like Apple, Google has contributed much set the standard for elegant design. I suspect when Google first became popular, the Wikipedia definition of “elegance” given above — “surprisingly simple yet effective” — is just what a lot of people thought — How could this young upstart, with a homepage that was made up of mostly white space compete against the link-laden gateway pages of the era? And, of course … Wikipedia fits its own definition of Elegance – “surprisingly simple yet effective” — Who would have predicted the simple idea of users making the best dictionary in the world? Posted in Apple, Elegance, Google, PicsNo, Twitter, Uncategorized, Wikipedia. Starting even before it was launched, the iPad has been widely viewed as a savior for traditional publishing, and especially for magazines, with its rich multitouch interface and its potential for the seamless mixing of text and pictures. So it’s not surprisinig that magazines have been in the lead in touting the iPad, as in Newsweek’s “What’s so great about the iPad?” cover story at left. One simple, easy-to-overlook, reason for the iPad-magazine connection is the iPad display screen’s 4:3 aspect ratio (the ratio of the width of the image to its height). 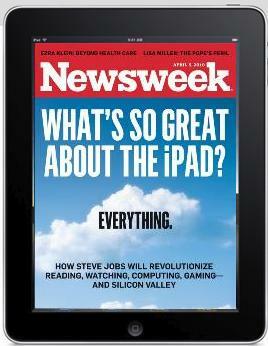 Many popular magazines (like Newsweek) have this same 4:3 aspect ratio, making them an excellent fit for the iPad. The 4:3 aspect ratio is not a new one for computer displays — it was common before 2003, when it was mostly replaced by a 16:9 ratio — but what is new on the iPad is that it’s seen as being used primarily in portrait mode — like magazines & books — instead of the usual landscape orientation of computer displays. Posted in Apple, iPad, PicsYes, Uncategorized. 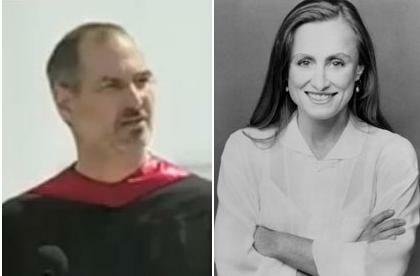 I find the Steve Jobs-Mona Simpson story fascinating — biological brother & sister (with a Syrian father) raised in separate families, who never knew about each other until Jobs was 27 – In a nutshell: Jobs, raised in a modest middle-class family in California, becomes the highly successful genius head of Apple, then discovers that he has a sister who was raised by their (American) biological mother in Wisconsin, who is also a genius, novelist Mona Simpson. After meeting, they form a close relationship. When Jobs found Mona Simpson, a sister who had grown up in entirely different circumstances, it was as if they had been part of some nature-versus-nurture experiment. He was struck by the similarity in their intensity, traits and appearance. Since he was a teen-ager [Jobs] had made occasional efforts to locate his biological family. He had nearly given up when he discovered, at the age of 27, that his biological parents had another child later whom they had kept, his younger sister. For reasons of privacy, Jobs explains, he won’t discuss his biological parents or how he ultimately tracked down his sister. A few words about how I found this article, and the difficulty of finding information on the Jobs-Simpson relationship — I started, of course, with a Google search for Steve Jobs Mona Simpson – The first two hits are the Wikipedia articles on Jobs and Simpson, which is an indication that there’s nothing very definitive about the relationship between the two — If there were, it would be more highly ranked than the Wikipedia articles. The Lohr/NYT article above is #3. It deserves this high ranking, because it has the best commentary on the Jobs-Simpson relationship, looked at from both siblings, instead of being from the viewpoint of one or the other of them, as in the other top 10 hits. Oddly, however, Google links to a reprinted version of the article instead of the original NYT version, maybe because it’s all on one page. 22. Andy Behrendt, “Apple Computer mogul’s roots tied to Green Bay,” Green Bay Press-Gazette, December 4, 2005. Presumably the article is unlinked because it’s no longer available from the Green Bay Press-Gazette. It is available here (scroll ca halfway down page for it).